The extreme far north (or south) isn't the only place on Earth that spends the winter locked in perpetual darkness. Beginning in September and ending in March, the Norwegian town of Rjukan is cast into a perpetual shadow. But no longer: This month, engineers are completing The Mirror Project, a system that will shed winter light on Rjukan for the first time ever. The "hot spot," in this case, is a 2,000-square-foot circle on the town square—soon to be converted into an ice rink (apparently, the reflected light still won't be terribly warm). When Rjukan begins to fall into shadow roughly a month from now, the mirrors will begin their first tests. "The project will result in a permanent installation which, with the help of the 300 square foot mirrors, will redirect the sun down into the valley," explained town reps. "The square will become a sunny meeting place in a town otherwise in shadow." The entire operation, amazingly, is set to cost less than a million dollars. As lovely as it is, the Mirror Project forces us to wonder: Why was Rjukan built in the first place? In fact, it was settled around the turn of the century, when a famed Norse industrialist named Sam Eyde built a hydroelectric factory in the valley. It turns out that Eyde had the mirror idea first—but had no way to implement it. According to TIME, his alternative was to build a cable car that workers could use to escape the valley floor for a few hours on weekends. 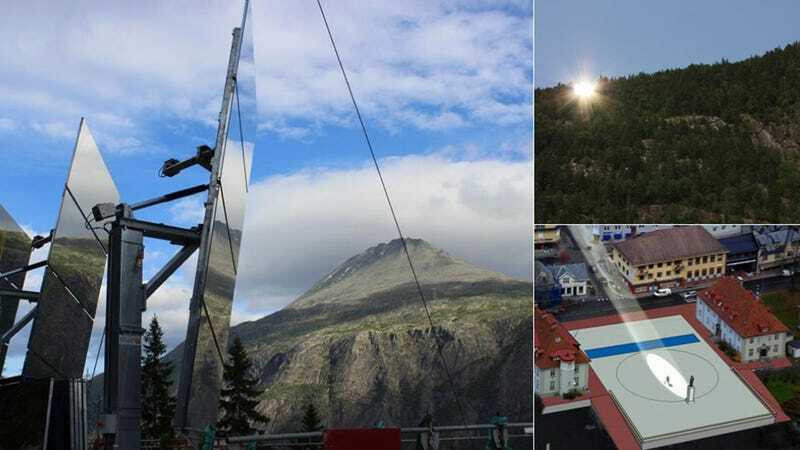 It may be the most extreme example, but Rjukan's mirror won't be the first artificial sun in Europe. In 2006, a small Italian town in the Alps called Viganella installed a 26-foot-wide mirror atop a neighboring mountaintop. Viganella, like Rjukan, sits at the bottom of a valley, and for 82 days of the year it receives no direct sunlight. Their mirror—which is still in use today—even became the subject of a documentary called Lo Specchio ("The Mirror"). Meanwhile, the Austrian town of Rattenberg also installed its own heliostatic system around the same time. Images courtesy of Karl Martin Jakobsen via Visit Rjukan.